First of all, the box the router comes in is huge. I was actually kinds surprised, however, it's definitely a large device as well as is packed in a nice presentable way! I'm not a super fancy YouTube unboxer, so these pictures are just mediocre, sorry about that! One thing worth mentioning though is that Asus included a document regarding updating drivers for Windows devices with Intel Wireless chipsets. We did have 1 device that had an issue initially, so don't blame the router, update your drivers! Right out of the box I did what anyone does and punched in 192.168.1.1 and was redirected to router.asus.com . 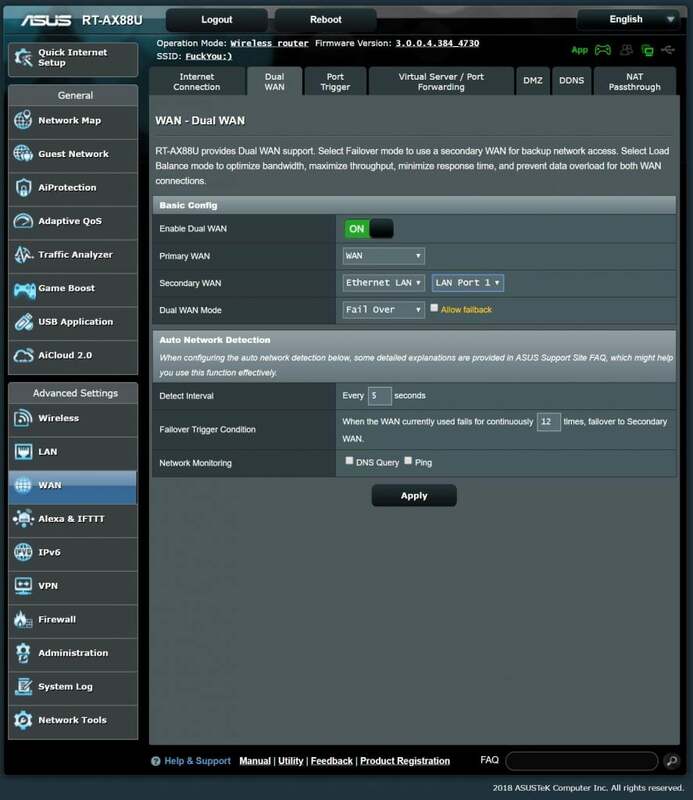 Out of all of the features, the only one that truly stands out as otherwise unique was the ability to enable a dual WAN setup. Pleasant surprise since the box and all documentation for the Asus RT-AX88U indicates it's a 1x WAN and 8x LAN device. The portal allows you to provision 1 of the 1st 4 LAN ports for use as a WAN failover or load balancer! The range on the Asus RT-AX88U is incredible. Previously I was relying on the WiFi access point AT&T provided as I wasn't sure what direction I planned to do with my home office, and what will be going with me to a true office space next year. Even with the 2 WiFi Range Extenders AT&T provided, coverage was pretty poor in my house which is just under 2,000sqft heated. Going out to the mailbox you were guaranteed to lose service regardless of use of 5ghz or 2.4ghz which is a pain for WiFi calls. Being anywhere in the house now I am guaranteed between 25dBm and 50dBm. Couple that with OFDMA and Asus claims you will receive up to 80% better range than 802.11ac (WiFi 5). Visit Lemacks Media https://lemacks.app/kxay6 for updates and more content.